My love for Portal Games has led to quite a number of purchases from their online store. And in recent years I've also been participating in their Kickstarter-style pre-order campaigns for new games including interesting stretch goals. 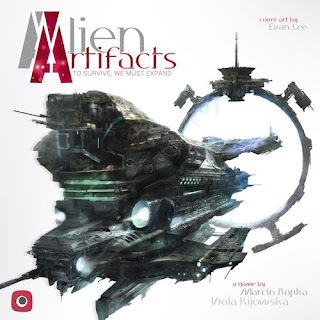 Alien Artifacts was my latest purchase of this nature and it's one that I was fairly curious about during the campaign. After all it is a game that promised a 4X style experience somehow and that was an intriguing concept. The game shares some similar systems with Imperial Settlers and other Portal releases but the system is significantly different enough to feel original in itself. The clever card mechanic related to the double-sided cards that make up the main part of the game do make for some interesting play experiences. Synopsis: Alien Artifacts is strategy card game created by Marcin Senior Ropka and Viola Kijowska. The space exploration game supports 2-5 players and runs fairly quickly. The game has each player take on the role of a different human faction going out to explore the stars. Each works to expand their respective empires by building ships, developing technologies or discovering planets as represented by matching cards. And each card is double-sided, which gives the players the option to play them Logistics side up for long-term benefits in-game or Operations side up for instant effects or end game victory points. Most of the game is tied to Resource cards that are primarily used to move ships from Under Construction to be part of your Empire. But these same cards will determine one's ship attack strength during combat with aliens or other players, to check if Operational technologies will score mid-game or if planets will score victory points when mined. Finding a way to make the most of your race's abilities and score as many points as possible before the game ends drives the whole game. What I Liked: I really enjoy the double-sided cards and how one must decide how cards will be played to make the most of things. It's easy to want to build more and more Logistics cards to aid Empire expansion as costs increase with every new card added. But you also need to think about the end game and how to score points apart from the points each card in your Empire provides. And toggling through these options makes for some clever gameplay. And I rather appreciate the efforts to make the Resource cards universally useful. With so many game mechanics tied to these cards including determining what ends the round and brings the end game closer, it's a marvel how they came up with this idea. It all certainly works out well enough when you're looking for ways to score points. What Could Have Been Better: On the flip side, the random nature of the cards can also hold certain aspects of the game back. Trying to score victory points with operational technology cards is crazily difficult as you need to match the technology card symbol with a random draw from the Resource deck. And while you'd think that there's about a 50% chance as each card has two symbols on it, but in practice I've rarely seen this happen. Planets "producing" cards stands a somewhat better chance though and I don't know how that math works out. The Alien Artifacts side of the game does feel a little underwhelming given how much effort it takes to get them. In our games thus far one or two cards have felt decently powerful but more often than not the artifacts feel not as powerful as you'd expect. So in the end it feels smarter to just get more victory points instead of artifacts. More quirks of the system. TL;DR: Alien Artifacts is still a clever game that takes elements from games like Imperial Settlers but comes up with something else entirely that is unique and pretty fun. The random bits of the game can slow things down somewhat but in the long run it's still a good strategy piece. Thus the game gets a good 4 crazy technologies out of a possible 5.